Today was the memorial service for Jamie’s Grandfather, Cullen Sykes. I had the honor of being a pallbearer and getting the chance to know him. He was 91 when he left us to be with the Lord. This man loved the Lord and placed Him first in his life. It was very interesting to learn a few of the things he had done in his life. He served in WWII in the Army Air Corp a division of the Army before the Air Force was established. 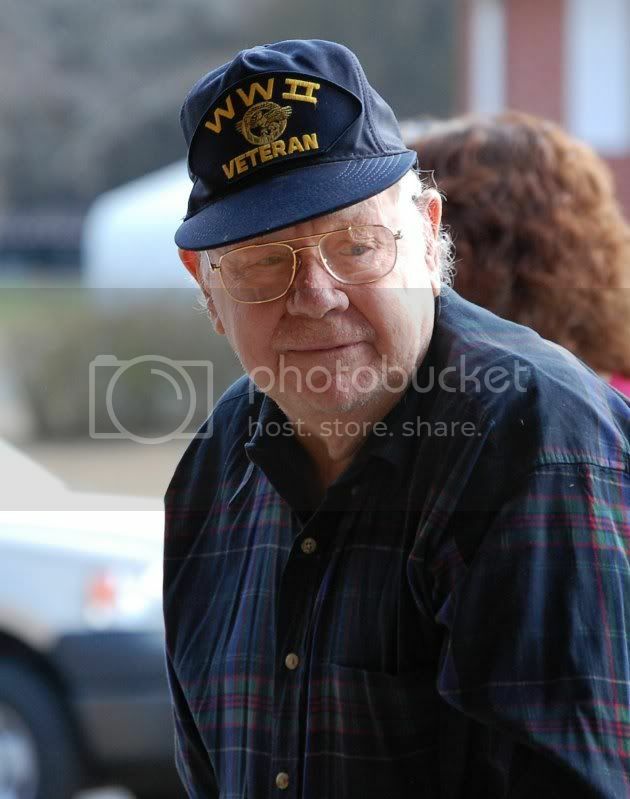 He also served in the Navy Reserves for about five years after WWII. He worked for Lockheed for thirty years and invented a lift for the C-130, that is very impressive to me. The Reverend asked him about five days before he left us if he had any regrets, after thinking about it a while he said that his only regret was that he did become a Christian sooner in life. Now that is an awesome answer, and shows that as a Christian, we want to spend as much time with our Lord as we can. At the funeral home there was singing, stories told and a short sermon to give people a chance to accept Jesus as their personal savior. There is not much more that a Christian could ask for at the memorial service in honor of his life here on earth. At the graveside service there was more singing, a Military flag ceremony with the playing of taps, and a Masonic ceremony. Mr. Sykes last wish was “Just Love Me”. Believe me, after watching the memorial today, there is not doubt that this great man of God was loved. Check out Jamie’s blog to see old photos of the family.